Since I knew the size and layout of this particular venue, I opted to leave the sub behind and take just the K12s, which turned out to be a fine decision. As with most receptions, the first couple of hours was just background music, so to bring out the bass, I had set both speakers to the “DEEP™” LF position. I found this provided a very profound, yet pleasant “thump,” especially at low volume levels. Due to the L-shaped configuration of the hall, I had little choice but to place the K12s slightly in front of, and tightly to the sides of my work 6’ work table. When it came time to crank the music and get jiggy, I quickly discovered that this was not a good choice. That wonderful, tight, shotgun bass that was shakin’ the booties on the dance floor was a horrible headache-inducing drone from where I was standing. At this point, I was reminded that these speakers have a lot of power – in fact, they are rated at 131dB—that’s darn loud. Proper placement if essential. While it may not have been the most comfortable situation for me, it sounded great on the dancefloor. And that’s what really matters. The next morning, it was a rush to get the K12s back to up to the church and ready to amplify the glorious voices and instruments of the praise team. This was accomplished without a hitch…well, maybe one hitch. Seems I had left the EQ switches in the DEEP™ position, and while it sounded fine out in the congregation, I could tell by the wincing look on the face of one of the singers who was standing very close to one of the K12s that they were really having a hard time hearing over the bass. Some quick EQ’ing on the board end, and things were fine, but it underscored again the importance of making sure to position the speakers correctly, set the proper EQ and then listen to them at “party volume” before anyone else is in the room. The following Saturday night required the K’s as I provided background and dance music for a family party at a swanky local country club. This time, I rolled the KSub along to handle the bass, and utilized the 7.5° tilt feature to aim the speakers down slightly so that I was not getting blasted with bass. Just prior to the dance music, we (yes, including the DJ) were invited outside for a fireworks display, after which, I figured, I could play as loud as I wanted and no one would complain. This time, I was right, and had really hit the sweet spot as far as how to get the best sound from this system. Standing behind the speakers is obviously not the best place to listen from, but with the KSub covering the bottom, I was able to set the K12s much more conservatively and provide the group with crisp and clean highs and mids that cut nicely through the tight bottom coming from the KSub. Overall, I’d have to say that QSC created a exceptional package with the K-Series. As I mentioned before, although these cabinets are relatively small, they pack a lot of power. Plug something in wrong, or accidentally have the power on when you thing it’s off and you’ll get an earful really fast. On the other hand, isn’t it always nice to know you have more power than you’ll probably need? Not only do the K Series models provide great sound for speakers in their size and price range, they also offer you set-up options and configurations that can make them true multi-purpose units. And the more multi-purpose any piece of gear is, the greater the opportunities for you to make a profit when it’s plugged into the wall. Update: By the way, if you would rather have wood enclosures, QSC has recently released the KW Series as an alternative to the ABS cabinets of the K Series. 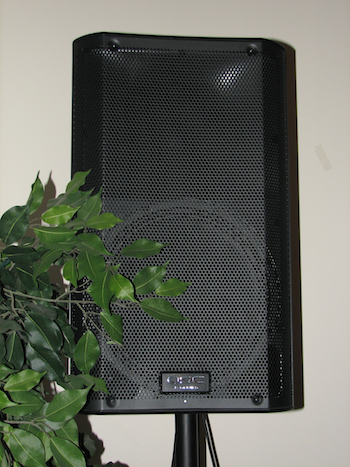 KW’s also feature larger woofers as well as a three-way configuration not found in the K Series Line. This post courtesy of the L2P Network. Live2Play, Play2Live.